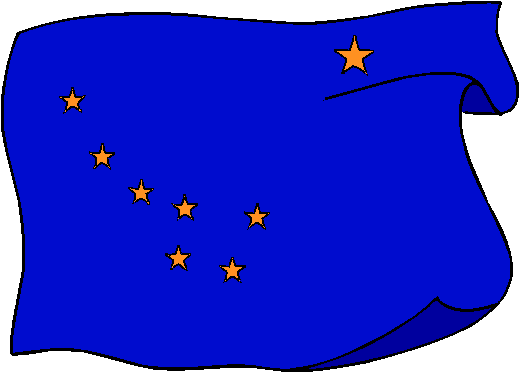 The flag of Alaska consists of eight gold stars representing the Big Dipper (Ursa Major) and the North Star on a dark blue field. "The blue field is for the Alaska sky and the forget-me-not, an Alaska Flower. The North Star is for the future state of Alaska, the most northerly of the union. The dipper is for the Great Bear symbolizing strength." 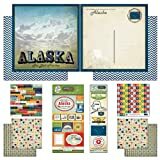 Proudly made in the USA, Scrapbook Customs Vintage State Scrapbook Kits are perfect for Scrapbooking your favorite vacation photos. The items included are educational, so they are perfect to help your kids with their state reports. Kit includes four background papers, three state papers, and a travel collage paper with 60 plus phrases. It also includes a paper cut out alphabet with 135 characters and a half sheet of state fun facts to accentuate your projects. Vintage stickers with the state flag, state shape, state symbols, and more are also included. Our papers and stickers are made of high quality cardstock that are acid free and lignin free.